No. 19 Quinnipiac plays a lone game this weekend with a Friday match-up against the Clarkson Golden Knights, a team a one spot below the Bobcats in the standings but still five points back of Quinnipiac. Rand Pecknold's team is holding firm at the number five spot in the ECAC but is still looking to secure a top four seed for the conference tournament. They currently trail Cornell by one point in the standings but the Big Red have one game in hand on the Bobcats along with four of their last six games at Lynah Rink with a North Country trip mixed in between. The Golden Knights come to Hamden having played much better on the road (6-4-2) than they have at Cheel Arena (6-8). Clarkson has impressive road wins against UMass Lowell, Notre Dame, Union and Vermont along with a tie at Providence. Casey Jones team was expected to have a better record at this point than 12-12-4 and part of that has been the inability to play over .500 at home. Quinnipiac all time against Clarkson is 14-7-3 with a 7-2-2 at home against them. Jones is 1-4 all time against the Bobcats as the head coach at Clarkson. Offensively the Golden Knights have gotten good production from a handful of forwards on their roster. 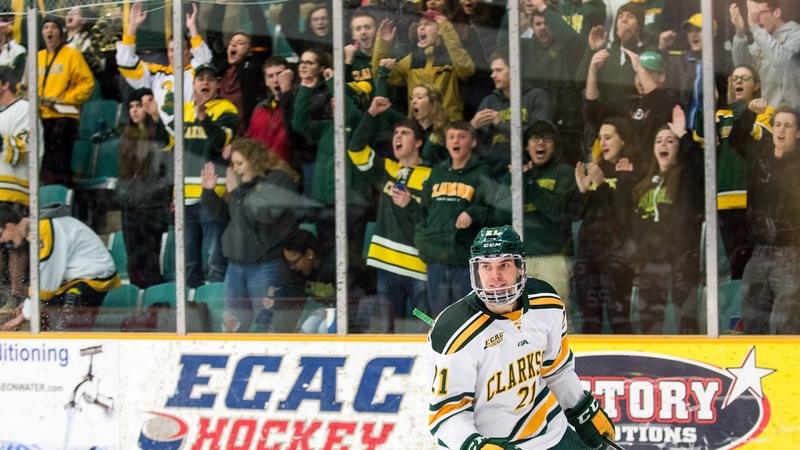 Junior Sam Vigneault 25 points (7 goals and 18 assists) and senior Jordan Boucher 23 points (10 goals and 13 assists) lead the way for Clarkson in terms of being the top two players in points. Following those two players are three freshman that are off to terrific starts in their career in Nico Sturm 19 points (8 goals and 11 assists), Devin Brosseau 18 points (6 goals and 12 assists) and Sheldon Rempal 18 points (7 goals and 11 assists). These three were expected to be the future of the Clarkson offense except they are contributing immediately for Casey Jones team. Also in that offensive mix is senior Troy Josephs 17 points (10 goals and 7 assists). All six players are power play threats as well. Another freshman not getting as much pub as the other three is Latvian native Haralds Egle who has 11 points (6 goals and 5 assists) including three power play goals. The Golden Knights average 3.07 goals per game which ties them for 22nd in the country in scoring and their power play is 26th at 18.98% (26-of-137) one spot behind Quinnipiac. The Bobcats will need to be on their game defensively as this is a Clarkson team that has many weapons that can hurt you. The one thing about this Clarkson offense is they do seem to struggle against good defensive teams and really have only put up large goal totals against Brown and RPI twice which has skewed their goals for average a bit. 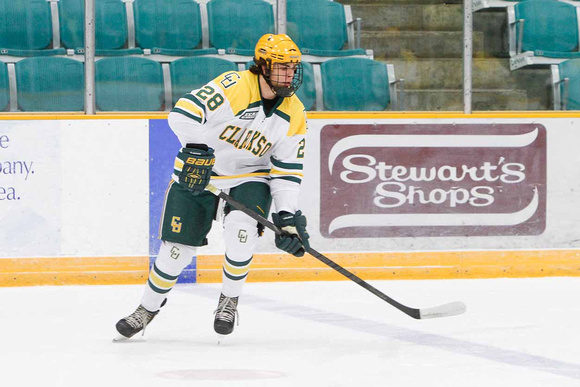 Clarkson has struggled defensively this year at times and it has showed to a tune of giving up a three goals per game this year which ties them for 35th in the country in that category. They have also given up five or more goals in seven games this season including to Quinnipiac when they met back in Potsdam in November. Its a big problem why this team is only .500 at this point in the season instead of in the top four and playing for a bye. They are led by senior James de Haas (2012 6th round, Detroit) who has 14 points and junior Kelly Summers (2014 7th round, Ottawa) who has 11 points. The Golden Knights have also mixed in three freshman at times on defense with different rotations so there has been inexperience at times back there. But over the course of the second half of the season the defense has shown some improvement giving up only 2.50 goals per games over its last eight games. They are tied for 24th in the country for the penalty kill at 84% (137-of-163) but they are most penalized ECAC team and that should be able to favor Quinnipiac's power play which has scored seven power play goals in its last four games. In goal Clarkson turns to freshman Jake Kielly who has been solid this season with a record of 11-11-4 with a 2.67 goals against average and a .910 save percentage. He has two shutouts this season against Merrimack and Notre Dame. Kielly has played well in the second the half of the season to a tune of a 2.37 goals against average. In road games this year he is averaging 2.33 goals per game so he has played better on the road than at home. He brings size in goal at 6'2 and has a championship pedigree from a Clark Cup win with Tri-City a year ago in the USHL. This is an important game for the Bobcats as they continue to chase points as they need to keep pace with Cornell and hope the Big Red can slip up down the stretch paving a path for Quinnipiac to get a first round bye. The Bobcats need to treat every game remaining in the regular season as one game season and focus solely on that game at hand and not look past any of their opponents remaining. ECAC points are what matters at this point in order to position the team for a potential deep playoff run to Lake Placid.